This innovative technology is at the forefront of dry eye treatments. In fact, we are only the third Optometry clinic in Canada that has introduced IPL treatments to our patients! Anyone with dry eye knows how frustrating the symptoms can be. This is especially true if traditional dry eye treatments are proving to be ineffective. Since we opened our clinic nearly 24 years ago, we have worked with many patients towards relief of their dry eye symptoms. As we move into spring, we wanted to highlight two main points: the potential relationship between seasonal allergies and dry eye, as well as how IPL treatment can provide relief for the associated symptoms. Conventional wisdom states that dry eye and seasonal allergies are two distinct things, despite having some similar symptoms. However, recent research suggests that there may be a larger relationship between allergic conjunctivitis (seasonal eye allergies) and dry eye. An April 2015 article published on AAO.org notes a correlation between peak seasonal allergy season and dry eye diagnosis’. Looking at the data, a fairly strong connection between seasonal eye allergies and dry eye can be seen. While more information on this area is required (and further research is ongoing), it’s worth noting that a correlation between allergens and dry eye may exist. If you experience symptoms similar to what is outlined above, and especially if these symptoms occur when allergy season has died down, we recommend you visit us for an eye exam3. IPL (intense pulsed light) is a state of the art treatment that is safe and effective. 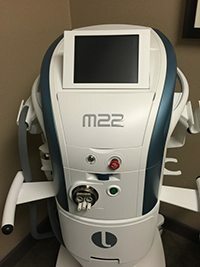 The treatment uses powerful pulses of light (in the 500 to 800 nm wavelengths) to introduce an anti-bacterial and anti-inflammatory response in the eyelid and surrounding tissues (notably, the meibomian glands, which are targeted directly). It sounds complicated, but in reality, it’s simply a very technologically advanced warm compress. This treatment causes the glands to secrete more normal fluids, improving your tear quality. As you can imagine, this has a notable impact on the severity and and frequency of dry eye symptoms. Treatments typically require three to five sessions to normalize the glands, with maintenance sessions once or twice per year thereafter. Book an appointment with us to examine your eyes and discuss your symptoms. We would be happy to talk more about IPL treatment and whether or not it’s a viable treatment option for you.